Since my profession and hobby all live in horticulture, from when I start seeing a trend to when a client makes a request can take a few years. Cutting gardens have long been increasing in popularity, but this year I have seen the flip of clients looking to replace veggie garden space with purely cutting gardens or a large portion devoted to flowers over veggies. Floret Flower spearheaded the movement in the states and the publishing of her book gave folks a photo driven textbook to study. Martha Stewart followed with her own book bridging the growing to completed arrangements. 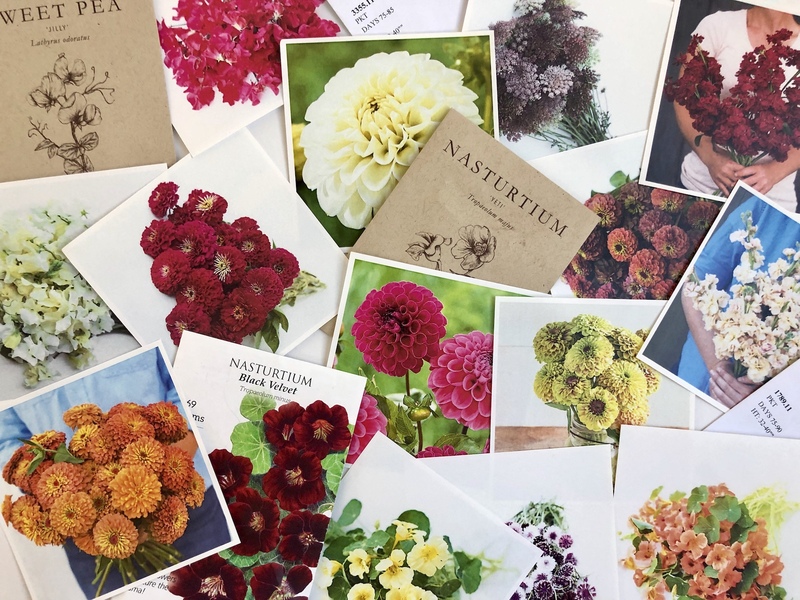 Also with the movement away from structured exotic floral arrangements to organic, foraged and from the garden florals, homeowners are feeling confident they can do it themselves. It has been a steadily growing gardening trend making more of the “yard” productive. A portion of the mood board we created for clients to share the plan for summer cutting gardens. We ordered a lot of ours late last year to get the selection we wanted. The Zinnia Queen collection in variations of lime was one we wanted to have long with a selection of sweet peas for climbing and nasturtium to have billowing over the edge of the garden. For our clients, we are handling the pre-frost propagation for many varieties and some we will sow directly. We are keeping with prolific blooms and in a range of colors and intensities, compared to an edited palette. In addition to seeds we will add some dahlia tubers and a few extra fillers like dusty miller. We are looking to create a garden that is easy(ish) to maintain and will look plentiful between cuttings. Currently we are not including perennials for the cutting gardens. Majority of our clients have large perennial beds they can cut from to complement their zinnias, sweet peas and dahlias. 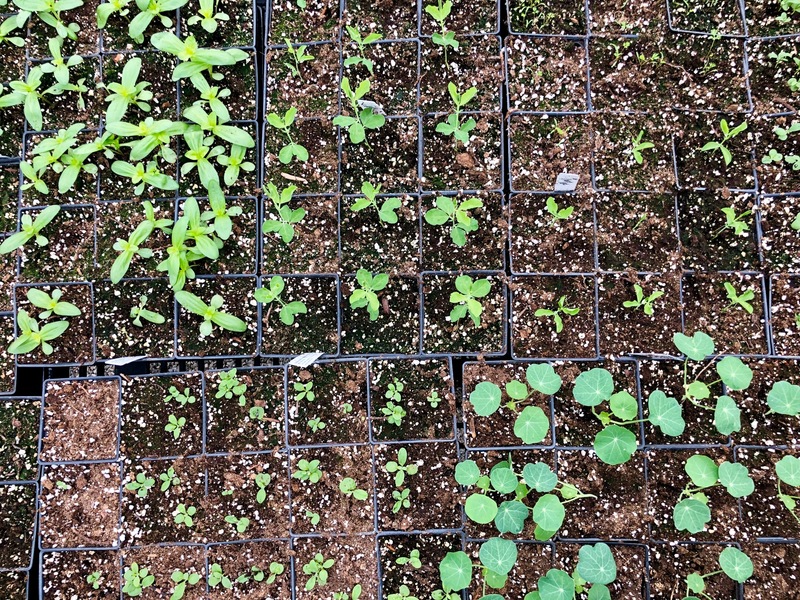 The seedlings in the greenhouse pushed very quickly. We will start spacing these later this week. We started in quarts compared to smaller plugs for planting. Two years ago we planted a cutting garden at home which is purely used for cuttings and bringing indoors. 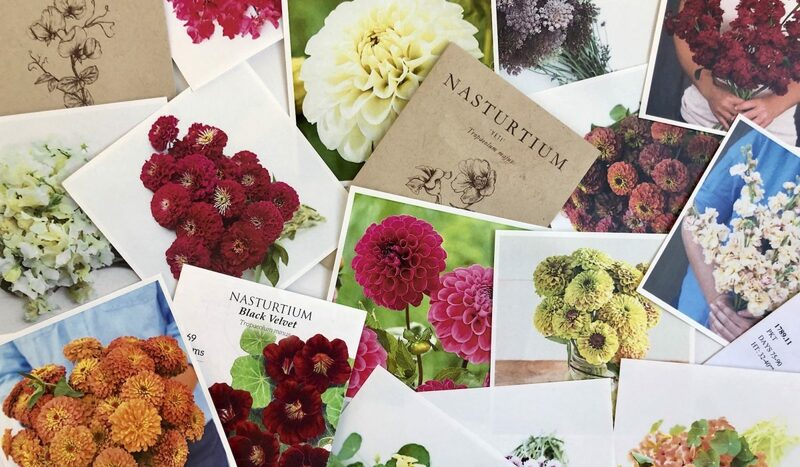 We have a a great time trying different seeds like last year’s Hairy Balls and always have great success with our dahlias and lilies. The purpose of this whole garden is the pleasure of bringing flowers inside so keep away from any labor intensive plantings. Will share photos of the cutting gardens once we start planting and things have started producing flowers and arrangements. This entry was posted in G A R D E N S, GARDEN DESIGN, gardening and tagged central ohio, Columbus, cutting garden, Cutting Gardens verses Veggie Gardens, dahlias, florals, Floret Flower, garden, gardening, landscape design, Martha Stewart, Plant Combos, sweet peas, Thinking Outside the Boxwood, Zinnia Queen collection, zinnias by Nick. Bookmark the permalink.